There are plenty of great ice cream places in LA, but only one of them is taking classic California tacos from dinner to dessert. Annihilating the Choco Taco of your ice cream truck-filled youth, CREAM starts with waffle batter spiced with vanilla, cinnamon, and nutmeg. The thin waffles are then shaped into tacos that you can fill with 20 rotating ice cream flavors and a shell-load of toppings. The shop suggests you share a taco since they're so big, but honestly that is just psychobabble. 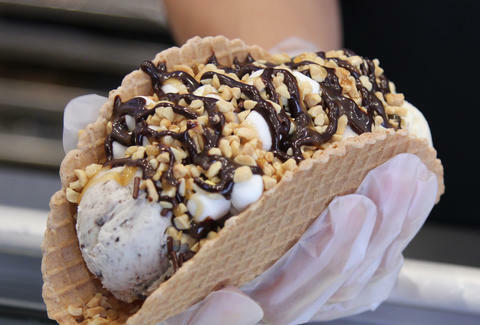 Check out the video below by Soy Nguyen to explore all the ways you can personalize your ice cream taco from CREAM.